Adjustable height frame is 64″ wide (load side) x 48″ deep x 95″ to 119″ high. Upper frame supports a vacuum loader and surge hopper (not shown) supplied and mounted by customer. Carbon steel tubular frame construction, with continuous welds. Inlet tube includes dust control inner liner with dust take off stub. Industrial grade inflatable spout seal assures a dust-tight seal to bag inlet. Adjustable manual bag strap hangers. 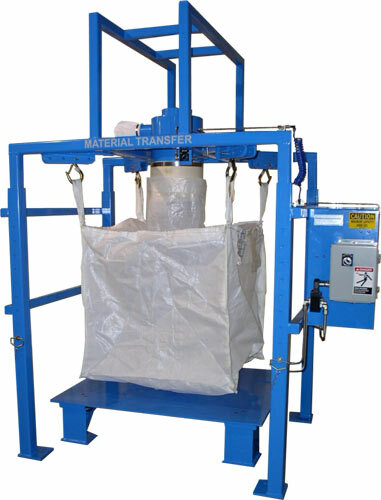 Bulk bag densification system designed to mount on customer’s existing platform scale. Unit cleaned and powder coated MTS Safety Blue. NEMA 4 rated carbon steel junction box and control enclosure.